What Really Causes Gridlock? Cities Do. The recently published University of Washington study on the effects of removing Seattle’s Alaskan Way Viaduct on commute times is but the latest data-based rebuttal to claims made by deep-bore tunnel proponents that a surface option would create gridlock. And that’s without any of the improvements to I-5, the street grid, and transit service that would be part of an integrated I-5/Surface/Transit alternative. 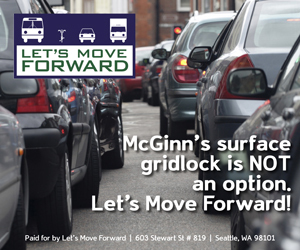 In recent months tunnel supporters seem to have coalesced on the idea that the “gridlock” meme will resonate with the general public, and they are no doubt correct. The only catch is that the gridlock claim has no basis in fact. No matter though, gridlock is a superb boogeyman, and that’s politics, as the Republicans have taught us well. 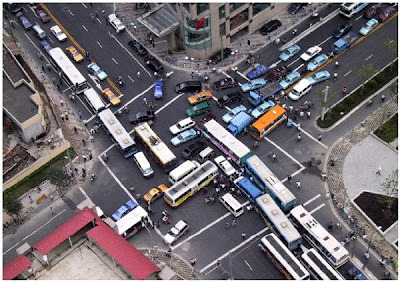 But stay with me now, because regarding so-called “gridlock,” here’s a reality that all of us city-boosters need to come to grips with: a dense city without heavy traffic congestion is like a unicorn. That is, it doesn’t exist. 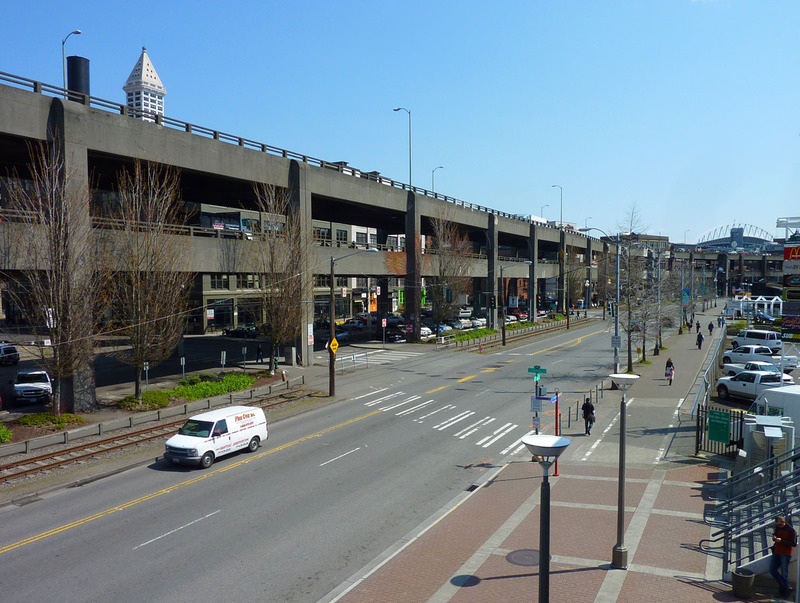 Tunnel or no tunnel, if Seattle densifies to the degree necessary for achieving significant sustainability benefits, all of our key roads are going to become jammed with cars. Road networks have inherent spatial limitations, such that in any urban area with a high density of homes and jobs, the demand for auto trips is guaranteed to swamp the capacity of the roads. It is as close to a mathematical certainty as you’ll ever find in the unpredictable realm of cities. Once this inevitable end is recognized, the only sane path for moving forward becomes clear: Stop throwing away precious public funds on roads, and instead invest in solutions that give people transportation alternatives. And it just so happens that that path is also one of our most promising strategies to address urban sustainability, and for Seattle, climate change in particular. Yes Seattle, expect more gridlock in your future (driven on Denny Way on a weekend lately?). It’s coming, whether or not we spend billions on a deep-bore tunnel in a flailing attempt to avoid it. But that doesn’t mean the downfall of civilization. The solution is to create a city in which people can get around without relying on a car. This includes not only building infrastructure to support walking, biking, and transit, but also creating compact, mixed-use centers that reduce the need for long trips. I have yet to hear a convincing argument for how a 2-mile underground bypass freeway for cars is anything but anathema to that strategy. It comes down to deciding what a city is for. Is it a place to get through, or a place to be? I love that it’s only 6 minutes even if we just tear the thing down and do nothing. I’d love to see some politician step up and propose that we close the thing right away for safety purposes. Everyone would quickly figure out that there’s no real gridlock and traffic is only slightly increased (and would level out over time, thanks to reverse induced demand). Where’s Earth First with a simulated quake when you need them? Good thinking! It’s called the Urban Village strategy and has been our Comprehensive Plan for over a decade…. I like the BAT lanes on 15th for that reason. If we really care so much about commercial vehicles (which I think is a reasonable concern), we should give them their own lane. And since they represent a relatively small volume of traffic, let buses in there as well. I don’t think that dense cities necessarily need to be gridlocked. There are a ton of factors that could determine whether a city will be gridlocked, but the ratio of road capacity to parking stalls is a good place to start, as that is among the largest costs to driving that influenced demand (perhaps gas price now, too). We can think about demand for roads like any other good; if the price is free (or heavily subsidized) and there aren’t any alternatives, then the demand will exceed the supply. In the case of downtown Seattle, the price of parking is key regulator of driving demand. The downtown core has a tremendous job density, but the street between I-5 and the water, Denny to Yesler are almost never gridlocked in the AM commuter peak because there is basically 1-2.5 stalls per every five commuters. But in the PM peak, we throw in non-commute trips and things get pretty backed up. Meanwhile, through traffic on I-5 is a mess, because the destinations probably have cheap/free parking, so the ratio of capacity to parking at the destinations for those using I-5 as a through-route is high. Gridlock is actually caused by people not obeying traffic laws and norms (i.e. don’t block the box). The street grid becomes “locked” by cars that have entered the intersection and are unable to exit it because other cars block their way. Calling increased surface street congestions and through traffic “gridlock” is hyperbole at best. Dag nabbit good stuff you whpseersnappirp! === Propose operating a Trolleybus Circulator system running in both directions on 1st & 3rd Aves between Mercer and Jackson Streets. This system would require the least trolleybuses to provide high-frequency service (3<5-minute wait) where it's needed most. On east/west cross-streets, propose a trolleybus route reconfiguration of similar circulator lines, all separate from the 1st-3rd trolleybus circulator (and a transfer between them required). Propose 2nd & 4th Avenues remain a transit couplet for regional bus routes with stops at east/west transfer points. === Several east/west trolleybus lines reach the waterfront near Coleman Dock and turn around on a "Proposed 2-lane Frontage Road" alongside a 4-lane Alaskan Way: Jackson-King, Yesler-Washington, Madison-Spring; Route 'down' one street and turnaround 'up' the adjacent street. === Midtown east/west trolleybus circulator lines reach 1st Ave and turnaround: Pike-Pine, Stewart-Virginia, Blanchard-Bell. The Trolleybus Circulators reach Broadway and Boren, and reach Harrison in Lake Union. Much overhead wire can be removed even as the trolleybus system is simplified. There are additional trolleybus circulator lines possible, but all can be selectively arranged to operate most ideally. Adjusting service for noon & off-rush hours is simple. Trolleybus routes outside this grid remain and entering it are coordinated to be complementary. === This Trolleybus Circulator design is basic supply & demand. The demand is high downtown, but the supply can't be practically arranged with an old route design which also serves low-demand markets outside downtown. Frequent service downtown, especially east/west, is essential to deal with the hills and encourage motorists looking to park to do so at the first convenient parking garage and finish trips via transit. === The Alaskan Way Frontage Road allows the Waterfront Streetcar (with 2 tracks) to be reinstalled. A Broad Street Bridge over the RR tracks allows the Waterfront Streetcar to extend 1 mile to Seattle Center. Wow!